In both my work and personal life, I’m often asked whether it is better to purchase a rigid-heddle loom or a multi-shaft loom. It’s almost impossible to answer that question. As Deb Essen said in her Handwoven September/October 2017 article about choosing the perfect loom, “It depends.” She was talking about choosing between different types of multi-shaft looms. 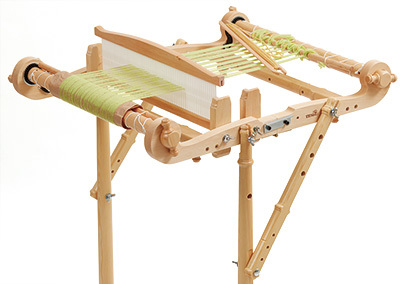 Add rigid-heddle looms to the equation and choosing a loom becomes even more complex. I weave on both rigid-heddle and multi-shaft looms. In my opinion they complement each other perfectly. I love the portability of rigid-heddle looms, the ease of direct warping, and how adaptable they are to weaver-controlled patterning using pick-up sticks. I don’t consider rigid-heddle looms as toys, but I do find a playfulness about them. I am a little more free-wheeling when weaving on a rigid-heddle loom and will try some pretty out there ideas just to see what happens. When I weave on a rigid-heddle loom I feel like I am intimately involved in changing the shed, throwing the shuttle, and handling the weft, and I love that. I appreciate my multi-shaft floor looms for their steadfast presence. They are strong and durable, and they hold tension perfectly when the warp is beamed correctly. Call me crazy but I am at my happiest while winding a warp, threading, and sleying, so the longer warping process isn’t a deterrent for me. I get a certain satisfaction in seeing a messy looking warp chain miraculously become organized and straighten during the warping process. For me, weaving on floor looms is more straightforward than on rigid-heddle looms. I treadle based on the draft I I used for threading, and there are few detours. Finally, the looms themselves are larger and have thick cloth and warp beams, that allow them to handle very long warps without a hitch, and me to weave multiple projects on one warp. The best way to know which type is best for you is to try them. Most guilds offer looms to borrow or rent at a very low fee. Many people watch videos and courses such as the Beginning Weaving with Tom Knisely Course about weaving on multi-shaft looms or Liz Gipson’s Slots and Holes video about warping a rigid-heddle loom, and then learn by doing. 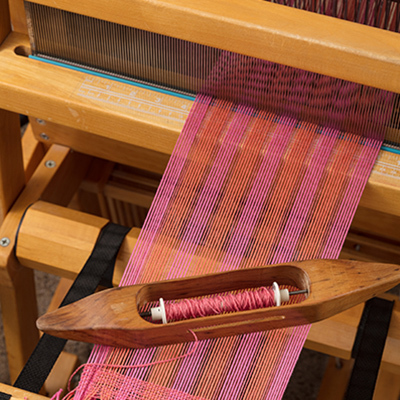 If a classroom setting better suits your learning style, some guilds offer classes in beginning weaving on both rigid-heddle and multi-shaft looms. 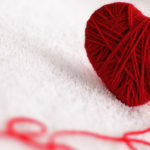 There are weaving schools around the country, although perhaps not as many as one would hope, and there are weaving conferences (primarily during the summer), where beginning weaving is taught. Try one or more looms of each type before making your choice. You could go my route: I chose both looms as best for me! If you have a loom and no teacher, here are some books and videos to get you started on your weaving adventure!